A portable pipe beveling tool for preparing torched-off or rough cut pipe ends and making them perfectly square in order to help create high-integrity welded pipe joints is available from Esco Tool of Holliston, Massachusetts. The Terminator MILLHOG® Pipe Beveling Tool attaches to the I.D. 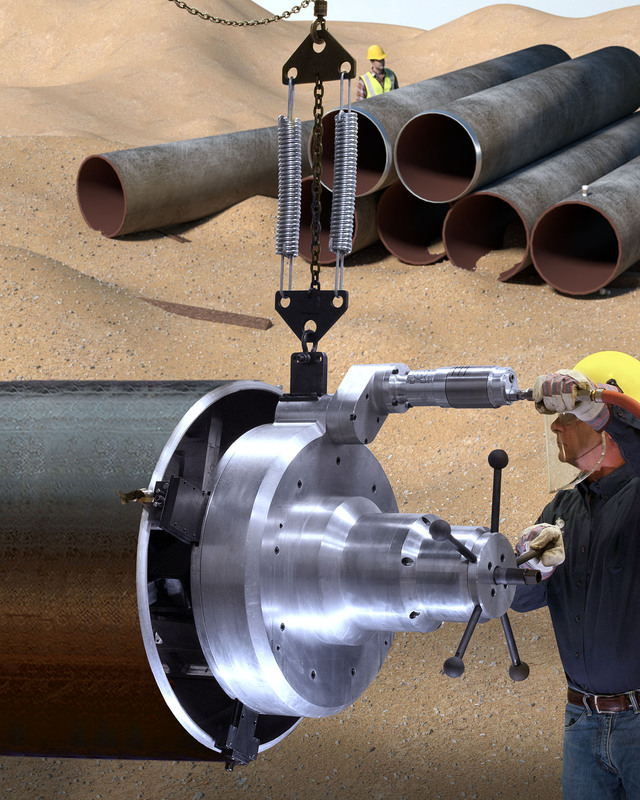 and features a tracker which compensates for variations in the pipe’s wall thickness to maintain a precision bevel and has a dual-spring safety hanger to simplify the alignment of larger pipe. Ideally suited for pipeline construction, it can produce any angle of bevel, face, and counter bore simultaneously. Designed for prepping pipe from 8-5/8” I.D. up to 36” O.D., the Terminator MILLHOG® Pipe Beveling Tool and has an adjustable tool holder that indexes and locks for easy setup. Equipped with user-selectable formed TiN coated tool bits, it comes with a 5 HP pneumatic motor or an optional hydraulic motor and produces a thick chip without requiring cutting fluids. The Terminator MILLHOG® Pipe Beveling Tool is priced from $47,995.00 and is available for rent in the continental U.S.A.